Acute lung injury is a common complication in critically ill patients. The present study examined possible immunomodulating effects of the volatile anaesthetic sevoflurane on lipopolysaccharide (LPS)-stimulated alveolar epithelial cells (AEC) in vitro. Sevoflurane was applied after the onset of injury, simulating a “postconditioning” scenario. Rat AEC were stimulated with LPS for 2 h, followed by a 4-h co-exposure to a CO2/air mixture with sevoflurane 2.2 volume %; control cells were exposed to the CO2/air mixture only. Cytokine-induced neutrophil chemoattractant-1, monocyte chemoattractant protein-1, intercellular adhesion molecule-1, as well as the potential protective mediators inducible nitric oxide synthase (iNOS)2 and heat shock protein (HSP)-32, were analysed. Additionally, functional assays (chemotaxis, adherence and cytotoxicity assay) were performed. A significant reduction of inflammatory mediators in LPS-stimulated, sevoflurane-exposed AEC was found, leading to reduced chemotaxis, neutrophil adherence and neutrophil-induced AEC killing. While iNOS2 was increased in the sevoflurane group, blocking experiments with iNOS2 inhibitor did not affect sevoflurane-induced decrease of inflammatory mediators and AEC killing. Interestingly, sevoflurane treatment also resulted in an enhanced expression of HSP-32. The data presented in the current study provide strong evidence that anaesthetic postconditioning with sevoflurane mediates cytoprotection in the respiratory compartment in an in vitro model of acute lung injury. Acute lung injury (ALI) and acute respiratory distress syndrome (ARDS) are common causes of acute respiratory failure in critically ill patients. Ventilatory support inducing mechanical stress on respiratory epithelial cells might also negatively affect lung tissue and contribute to the development and/or the course of ALI/ARDS. Early ALI/ARDS is characterised by alveolar epithelial and lung endothelial injury (destruction of the alveolar–capillary barrier), leading to increased permeability with pulmonary oedema, alveolar flooding and acute respiratory failure 1. Neutrophil sequestration and migration into alveoli remain histological hallmarks of ARDS, with neutrophils being key effector cells that further destruct lung tissue 2. Endotoxin-induced injury is an experimental in vitro and in vivo model closely resembling ALI and ARDS in humans. Upon stimulation with lipopolysaccharide (LPS), enhanced expression of the intercellular adhesion molecule (ICAM)-1, as well as the chemokines cytokine-induced neutrophil chemoattractant (CINC)-1 and monocyte chemoattractant protein (MCP)-1, seems to play a crucial role in the inflammatory orchestration 3–6. In the respiratory epithelial compartment, these inflammatory mediators are involved in the recruitment of effector cells, such as neutrophils and alveolar macrophages, which interact with target cells (alveolar epithelial cells (AEC)), thereby inducing cell death 7. In several models, enhanced expression of inducible nitric oxide synthase (iNOS) has been shown to attenuate lung injury 8, 9. Preliminary data from the current authors’ group when investigating the effects of AEC preconditioning with an anaesthetic followed by LPS stimulation were promising 10. The approach by which cells or an organ are pretreated with an agent to prophylactically reduce the occurrence of a subsequent injury is called “preconditioning”. This strategy, aimed at attenuating injury, was first described in a model of myocardial ischaemia/reperfusion 11. However, previous knowledge of the onset of the injury is required to render preconditioning effective. For this reason, intervention with a volatile anaesthetic soon after the insult, e.g. in the ischaemia/reperfusion model performed at the beginning of reperfusion (postconditioning), might be a more efficacious strategy for protecting an organ against an injury. Most of the postconditioning studies performed thus far have focused on myocardial ischaemia/reperfusion damage 12. Other organs, such as the lung, and different types of injury, including those which are endotoxin-induced, have not yet been assessed with regard to volatile anaesthetics and postconditioning. The purpose of the present study was to evaluate the effect of sevoflurane postconditioning in the in vitro model of endotoxin-induced injury. It was hypothesised that the volatile anaesthetic would attenuate the inflammatory response in AEC. The L2 cell line (CCL 149; American Type Culture Collection, Rockville, MD, USA) was derived through cloning of adult female rat lung of AEC type II origin 13. The cells were cultured in Dulbecco's modified Eagle's Medium (DMEM; Invitrogen AG, Basel, Switzerland), supplemented with 10% foetal bovine serum (FBS), 1% penicillin–streptomycin and 1% 4-(2-hydroxyethyl)-1-piperazineethanesulfonic acid buffer. They were grown in uncoated 35×10 mm plates (Corning Inc., Corning, NY, USA) to >95% confluence. To rule out mycoplasma infection, mycoplasma detection assays were carried out according to the manufacturer's protocol (Cambrex Bio Science, Rockland, ME, USA). Viability of cells was determined by the trypan blue dye exclusion assay. In addition, results were confirmed with a cytotoxicity assay (determination of lactate dehydrogenase (LDH); Promega, Madison, WI, USA). DMEM/10% FBS was replaced by DMEM/1% FBS 24 h before LPS stimulation. AEC were stimulated with LPS from Escherichia coli, serotype 055:B5 (Sigma, Buchs, Switzerland) in a concentration of 20 μg·mL−1 in DMEM/1% FBS for 2 h (control group-only stimulation with PBS in DMEM/1% FBS instead of LPS), followed by another incubation of 4 h.
AEC were stimulated with LPS (controls with PBS) for 2 h, as described, then placed in two humidified airtight chambers (Oxoid anaerobic jar; Oxoid AG, Basel, Switzerland). Air/5% CO2 was flushed through the inlet of the two chambers; one air mix contained sevoflurane (Sevorane®; Abbott AG, Baar, Switzerland), provided by a sevoflurane vaporiser (Sevotec5®; Abbott AG). Within 5 min, sevoflurane reached the steady concentration of 2.2 volume % (monitored by Ohmeda 5330 Agent Monitor; Abbott AG) and chambers were sealed for 4 h. This concentration was also used in a model of postconditioning in myocardial ischaemia 14. At the end of the experiment after 4 h of postconditioning with the volatile anaesthetic, sevoflurane concentration was verified again to show the initial value of 2.2 volume %. Supernatants were immediately collected and stored at -20°C for further analysis (fig. 1⇓). Pilot studies had demonstrated the best degree of downregulation of inflammatory mediators with a sevoflurane concentration of 1.1–3.3 volume % (data not shown). Sandwich ELISAs were performed according to the manufacturer's protocol assessing the chemokines CINC-1 (R&D Systems Europe Ltd, Abingdon, UK) and MCP-1 (BD Biosciences, San Diego, CA, USA). The detection range for CINC-1 protein was 20–1,000 pg·mL−1; for MCP-1 it was 31.3–2,000 pg·mL−1. AEC were grown in 96-well tissue culture plates (Corning Inc.). Stimulation and postconditioning were carried out as mentioned previously. Cell-based ELISA was performed according to a previous protocol 15. Briefly, cells were fixed with 3% paraformaldehyde (Sigma) for 15 min, washed with PBS, and incubated for 1 h at 4°C with a mouse anti-rat CD54 ICAM-1 antibody (1A29; Serotec, Oxford, UK), diluted 1:2500 in PBS/0.05% FBS. A second incubation with an anti-mouse immunoglobulin (Ig)G peroxidase conjugate (Sigma; dilution 1:2500) followed for 45 min at 4°C. Accordingly, the cells were washed three times, OPD substrate solution (Sigma Fast o-phenylemediamine dihydrochloride; Sigma) was added to the wells and the reaction stopped with 3 M sulfuric acid. Finally, optical density was measured at 492 nm. Assessment of soluble ICAM-1 was performed using an SDS-polyacrylamide gel. Collected supernatant of AEC (25 μL) underwent electrophoresis and after separation, proteins were transblotted to a nitrocellulose membrane for 2 h at 200 mA. After washing with PBS, the membrane was blocked with PBS/4% low fat milk/0.1% Tween 20 for 1 h at room temperature, followed by overnight incubation at 4°C with a monoclonal mouse anti-rat ICAM-1 antibody (1A29; Serotec), diluted 1:1000 in blocking buffer. All washing steps were performed three times with PBS/0.1% Tween 20. A secondary horseradish peroxidase-labelled anti-mouse IgG (1:5000; Sigma) in blocking buffer was added for 1 h at room temperature. Signals were detected by enhanced chemiluminescence. Human neutrophils (interaction with rat cells shown in previous experiments 16) were isolated by gradient centrifugation over Ficoll-Paque (Amersham Pharmacia Biotech, Dubendorf, Switzerland), followed by 1% dextran sedimentation for 45 min to separate neutrophils from erythrocytes 10. After centrifugation, contaminating erythrocytes were lysed with distilled water followed by the addition of 2.7% sodium chloride to stop hypotonic lysis. Neutrophils were washed with PBS and resuspended at a total concentration of 1×106 polymorphonuclear leukocytes (PMN)·mL−1 in DMEM/1% FBS. After various time points of postconditioning, 600 μL of cell supernatant was filled into the lower wells of a transwell plate (Costar Transwell No. 3421, 5 μm; Corning Inc.). Neutrophils at a concentration of 6×105·mL−1 were added to the filter inlay. To determine basal migration, the lower well was loaded with DMEM 1%. After 1 h at 37% in air/5% CO2, filters were removed, neutrophils were lysed by 15 μL Triton-X 16% (Sigma), and 75 μL β-glucoronidase solution (4-nitrophenyl-β-d-glucuronide, Sigma) was added. The plate was incubated for 12 h at 37% in air/5% CO2. The reaction was stopped by a 60-μL glycine solution (Sigma) and optical density measured at 405 nm. A standard curve was made by applying the same procedure to determined quantities of neutrophils. Postconditioning of AEC in 96-well plates and neutrophil isolation were carried out as described previously. The 96-well plates were washed once with PBS, and 2×105 neutrophils were added to each well and incubated for 30 min at 37°C. Wells were carefully washed twice with warm DMEM and adherent cells were counted. To assess the role of nitric oxide, NW-nitro-l-arginine methyl ester (l-NAME), a nonselective inhibitor of nitric oxide synthase (NOS; Sigma-Aldrich, Steinheim, Germany), was administered to the samples at a final concentration of 50 μM. After a further 30 min, experiments were performed as described. Production of inflammatory mediators was assessed and cytotoxicity assays were performed. Total cellular RNA was isolated from confluent monolayers of AEC. Cells were lysed by adding monophasic solution of phenol and guanidine isothiocyanate (TRIzol® Reagent; Invitrogen AG). RNA was precipitated with chloroform and isopropanol, washed with 75% ethanol, and finally dissolved in RNAse-free water. Total amounts of cellular RNA were determined by absorbance at 260 nm. Random hexanucleotide primers and murine leukaemia virus reverse transcriptase were used for cDNA synthesis. Reverse transcription was performed with 0.8 μg RNA at 20°C for 5 min, 42°C for 30 min and 99°C for 5 min. Specific primers located on separate exons were designed to asses gene expression of iNOS2, heat shock protein (HSP)-32 and 18S (table 1⇓). RT-PCR products were resolved on 1.5% agarose gels (Invitrogen AG) and stained with ethidium bromide. PCR was also performed with 18S primers to ensure equal loading. mRNA/18S ratios were calculated. One of the ratios from the LPS+air group was determined as 100%, and all other rations were adjusted accordingly. All experiments were repeated at least three times, each conducted in triplets. Results are expressed as mean±sd. The difference between LPS+air and PBS+air was defined as 100% and was compared with the difference of LPS+sevoflurane and PBS+air, which allowed calculation of attenuation. To exclude any cell death-induced changes of protein expression, cell viability was assessed by the trypan blue dye exclusion assay. Sevoflurane-induced increase of cell death was not observed in any of the experiments. 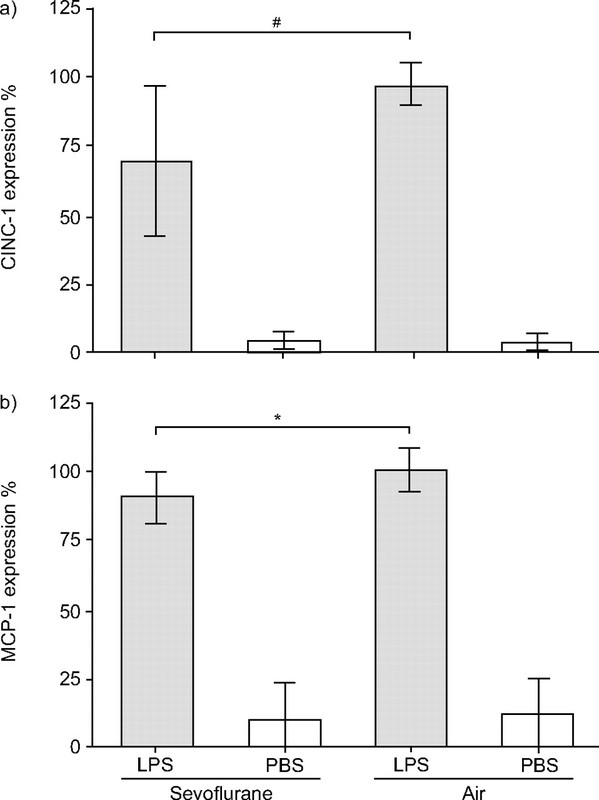 The production and release of the chemokines CINC-1 and MCP-1 upon LPS stimulation and sevoflurane postconditioning was assessed. All results are expressed as percentages, while the absolute values for CINC-1 ranged from 0.1 ng·mL−1 for PBS+air to 7 ng·mL−1 in the LPS+air group. The corresponding values for MCP-1 were 3 ng·mL−1 in the PBS+air and 50 ng·mL−1 in the LPS+air group. Exposure of LPS-stimulated AEC to sevoflurane resulted in a significant decrease of CINC-1 protein in comparison with the LPS+air group without postconditioning; CINC-1 expression was attenuated by 32% (p<0.005; fig. 2a⇓). MCP-1 production was reduced by sevoflurane in a similar way; the difference of MCP-1 in supernatants of AEC with and without postconditioning was 11% (p<0.05; fig. 2b⇓). a) Evaluation of sevoflurane postconditioning for protein expression of cytokine-induced neutrophil chemoattractant (CINC)-1. Confluent layers of alveolar epithelial cells were exposed to lipopolysaccharide (LPS) or PBS (as a control) for 2 h, followed by a co-exposure to 2.2 volume % sevoflurane (or to a control gas, air) for 4 h. CINC-1 ELISA was performed with supernatants. b) Evaluation of sevoflurane postconditioning for protein expression of monocyte chemoattractant protein (MCP)-1. Confluent layers of alveolar epithelial cells were exposed to LPS or PBS (as a control) for 2 h, followed by a co-exposure to 2.2 volume % sevoflurane (or to a control gas, air) for 4 h. MCP-1 ELISA was performed with supernatants. Values are mean±sd from five experiments. #: p<0.005 between LPS+air and LPS+sevoflurane; *: p<0.05 between LPS+air and LPS+sevoflurane. ICAM-1 is an important mediator within the inflammatory cascade. Cell-based ICAM-1 is responsible for effector cell adherence to target cells such as AEC, while shed ICAM-1 interacts with the counter-receptor on effector cells, thereby either attenuating or increasing the inflammatory process. Therefore, the present study determined not only cell-based ICAM-1 but also the soluble form. After sevoflurane intervention, cell-based ICAM-1 was decreased by 64% (p<0.005; fig. 3a⇓). a) Evaluation of sevoflurane postconditioning for intercellular adhesion molecule (ICAM)-1 protein expression. Confluent layers of alveolar epithelial cells were exposed to lipopolysaccharide (LPS) or PBS (as a control) for 2 h, followed by a co-exposure to 2.2 volume % sevoflurane (or to a control gas, air) for 4 h. Cells were fixed and ICAM-1 cell-based ELISA was performed. b) Evaluation of sevoflurane postconditioning for soluble intercellular adhesion molecule (ICAM)-1 expression. Confluent layers of alveolar epithelial cells were exposed to LPS or PBS (as a control) for 2 h, followed by a co-exposure to 2.2 volume % sevoflurane (or to a control gas, air) for 4 h. Soluble ICAM-1 was assessed in supernatants by Western blot. Values are mean±sd from five experiments. #: p<0.005 between LPS+air and LPS+sevoflurane; *: p<0.05 between LPS+air and LPS+sevoflurane. An attenuation of soluble ICAM-1, determined by Western blot, was achieved with the postconditioning set-up with 83% (p<0.05; fig. 3b⇑). Neutrophils are main effector cells in the acute lung inflammatory process. The biological function of the chemokines released from AEC to facilitate neutrophil recruitment was assessed with chemotaxis assay. Postconditioning with sevoflurane resulted in a significant decrease in migrated neutrophils to the supernatant of the LPS+sevoflurane group compared with the LPS+air group. At 4 h the difference was 76% (p<0.05; fig. 4a⇓). a) Determination of chemotactic activity in supernatants of alveolar epithelial cells with sevoflurane postconditioning (4 h). In total, 6×105 neutrophils were transferred to MultiScreen-MIC filter plates, while receiver plates were loaded with 150 μL of supernatant previously exposed for 2 h to lipopolysaccharide (LPS) or PBS (as a control), followed by a 4-h postconditioning with 2.2 volume % sevoflurane (or with a control gas, air). Transmigrated cells were lysed and β-glucoronidase solution was added. Optical density measured at 405 nm. b) Determination of neutrophil adherence to alveolar epithelial cells (AEC) with sevoflurane postconditioning (4 h). Confluent layers of AEC were exposed to LPS or PBS (as a control) for 2 h, followed by a co-exposure to 2.2 volume % sevoflurane (or to a control gas, air) for 4 h. In total, 2×105 neutrophils were incubated with AEC for 30 min. Nonadherent neutrophils were removed and remaining adherent cells were counted. Values are mean±sd from three experiments. *: p<0.05 between LPS+air and LPS+sevoflurane; #: p<0.0001 between LPS+air and LPS+sevoflurane. To further determine the biological role of sevoflurane-induced downregulation of cell-based ICAM-1, adherence assays with neutrophils were performed. Sevoflurane postconditioning for 4 h decreased adhesion by 71% (p<0.0001; fig. 4b⇑). As fewer neutrophils were adherent to LPS+sevoflurane-treated AEC in comparison with AEC exposed to LPS+air, neutrophil-induced AEC killing was assessed with the hypothesis that fewer adherent neutrophils would lead to a diminished rate of cytotoxicity in AEC. Cytotoxicity was determined measuring LDH release. Values from LPS groups were corrected to control values. Upon postconditioning with sevoflurane, death rate of AEC decreased by 26% (p<0.005; table 2⇓). This finding might be important regarding degree of lung injury. In order to evaluate whether iNOS2 plays a regulatory role in this process of possible injury-attenuating effect of postconditioning in AEC, expression of this mediator was determined. Interestingly, in the sevoflurane treatment group iNOS2 expression was enhanced by 125% (p<0.05; fig. 5⇓), assuming that NO might play a regulatory role in this process. However, performing blocking experiments with l-NAME, production of the inflammatory mediators CINC-1, MCP-1 and ICAM-1 was not altered, compared with the group without l-NAME blocking (data not shown). Similar results were seen regarding determination of death rate of AEC: no statistically significant difference in cytotoxicity could be detected between the LPS+sevoflurane und LPS+sevoflurane l-NAME group (table 2⇑). Evaluation of sevoflurane postconditioning for inducible nitric oxide synthase (iNOS)2. Confluent layers of alveolar epithelial cells were exposed to lipopolysaccharide (LPS) or PBS (as a control) for 2 h, followed by a co-exposure to 2.2 volume % sevoflurane (or to a control gas, air) for 4 h. RT-PCR (a) and subsequent densitometry (b) was performed for iNOS2. Values are mean±sd from three experiments (one shown). *: p<0.05 between LPS+air and LPS+sevoflurane. 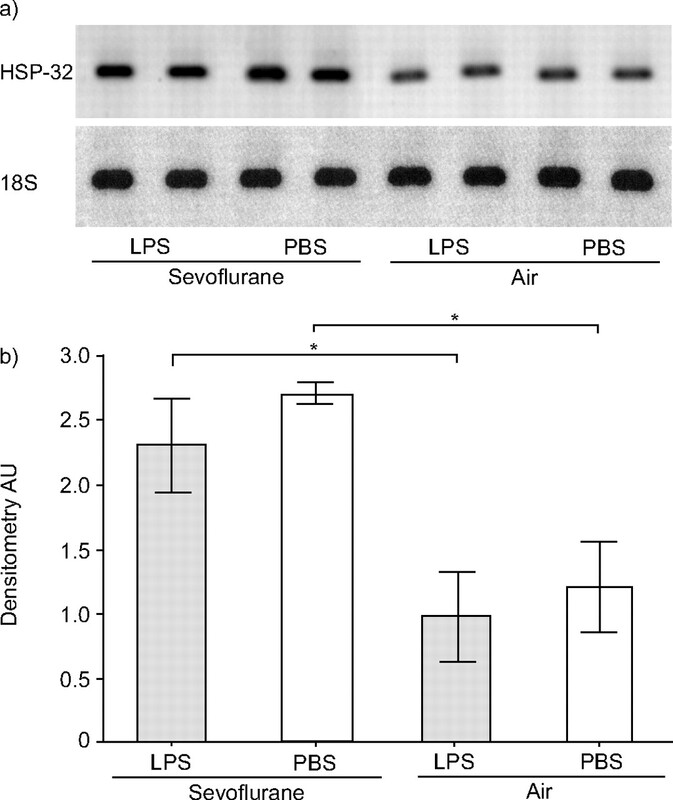 Enhanced expression of HSP-32 was observed not only in the LPS+sevoflurane but also in the PBS+sevoflurane group, indicating that sevoflurane might induce transcription of HSP-32 (p<0.05; fig. 6⇓). Evaluation of sevoflurane postconditioning for heat shock protein (HSP)-32. Confluent layers of AEC were exposed to lipopolysaccharide (LPS) or PBS (as a control) for 2 h, followed by a co-exposure to 2.2 volume % sevoflurane (or to a control gas, air) for 4 h. RT-PCR (a) and subsequent densitometry (b) was performed for HSP-32. Values are mean±sd from three experiments (one shown). *: p<0.05 between LPS+air and LPS+sevoflurane as well as PBS+air and PBS+sevoflurane. The present study demonstrates, for the first time, that anaesthetic postconditioning attenuates endotoxin-induced epithelial cell injury in vitro by decreasing production and expression of inflammatory mediators, resulting in decreased neutrophil recruitment, adhesion to AEC and AEC killing. In the last two decades, considerable effort has focused on limiting manifestations of post-ischaemic injury in the heart, using various cardioprotective strategies, such as preconditioning to attenuate reperfusion injury 11, 18, 19. Ischaemic preconditioning is an effective procedure for the attenuation of subsequent ischaemia-induced injury. Brief ischaemic episodes, followed by periods of reperfusion, increase the resistance to further damage 11. Ischaemic preconditioning probably triggers a complex multifactorial molecular process 20. It causes an increase in extracellular adenosine coupling to G-proteins, a process which activates protein kinase C, leading to a rapid phosphorylation of ATP-sensitive K+ channels (early protection, upregulation of defence mechanisms). A second, delayed protection seen 24 h after ischaemic preconditioning is believed to be due to an increased synthesis of HSP-70 and NO (delayed adaptation, synthesis of new proteins). In a similar manner to ischaemic preconditioning, volatile anaesthetics are known to have powerful cell-protective potential conferring relative resistance against myocardial cell death resulting from any injury (pharmacological preconditioning) 21. Although the exact signalling pathway is not yet fully understood, observations suggest that volatile anaesthetics protect the myocardium through mechanisms similar to ischaemic preconditioning. A new organ-protective strategy has been developed in the past, called postconditioning 22. Postconditioning implies repetitive ischaemic periods applied during early reperfusion, attenuating reperfusion injury. Regarding the signal transduction cascade, preconditioning and postconditioning share similar pathway elements, such as adenosine, which is increased due to a “stutter” (intermittent) reperfusion with a delayed washout. Both conditioning models, pre- and postconditioning, also enhance the production of NO, leading to an assumed myocardial protection through thus far unknown mechanisms 23. The present study’s model of endotoxin-induced injury with late application of volatile anaesthetics reflects a postconditioning situation as in cardiac interventions. The protective cellular mechanism of sevoflurane application might be similar in cardiac as in pulmonary tissue. The current authors’ interest was to develop a new in vitro model of protection in acute lung injury with volatile anaesthetic intervention, defined as a very late postconditioning even after the onset of injury. This approach is clinically very relevant, as in contrast to ischaemia/reperfusion, the postconditioning treatment is not tied to a specific time point. Importantly, the approach of administering volatile anaesthetics only after the onset of lung injury could be readily applied to all clinical scenarios in the operating room and even later in the intensive care unit. One must consider the fact that these studies were performed in vitro. All possible positive or negative haemodynamic or pulmonary effects of a volatile anaesthetic were not evaluated within the present study. When organ protective strategies were first initiated, the use of volatile anaesthetics was limited to ischaemia/reperfusion injury. However, more and more volatile anaesthetics were also used in different experimental set-ups. Some studies in AEC have demonstrated that exposure to volatile anaesthetics decreased secretion of pro-inflammatory mediators upon interleukin-1β stimulation 24. Other in vitro studies have shown that volatile anaesthetics decreased Na+/K+-ATPase and sodium channel activities 25. A recent in vivo work from Reutershan et al. 26 presented attenuation of the inflammatory response in the endotoxin-induced lung injury upon preconditioning with the volatile anaesthetic isoflurane. No information is thus far available about any possible pathways that are involved in this protection. Injury to cells or tissues related to an inflammatory response can be ascribed to a complex array of mediators generated and released from activated phagocytes, such as neutrophils and macrophages. Chemokines are implicated in the recruitment of effector cells toward target tissues, whereby CINC-1 is a strong neutrophil chemoattractant. With sevoflurane intervention, the current authors could demonstrate an attenuated chemotaxis reaction. The results suggest that sevoflurane might reduce AEC-induced accumulation of neutrophils in LPS injury. 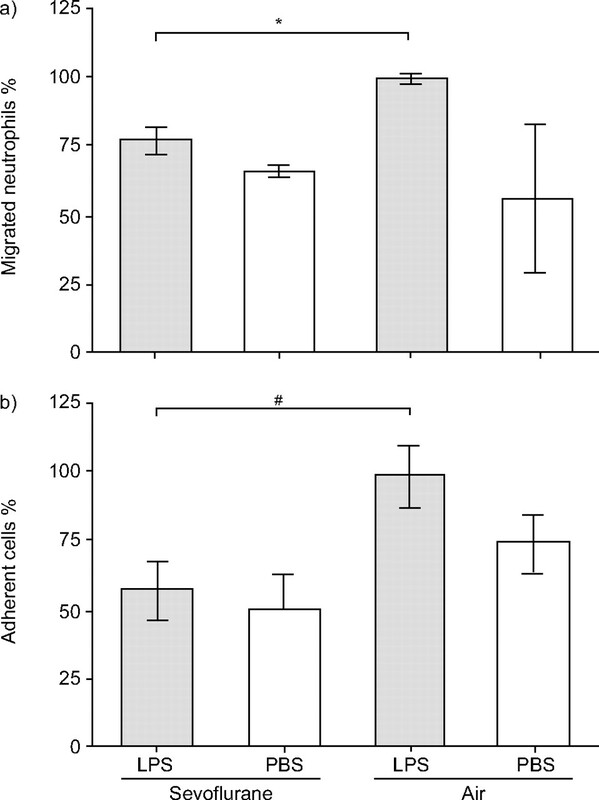 While moderate differences in measured chemokines were observed, the results from chemotaxis assays were of larger magnitude. This discrepancy could be due to the fact that other chemoattractants that were not determined play a major role in neutrophil recruitment. The adhesion molecule ICAM-1 is upregulated on different cell types such as endothelial and epithelial cells, fibroblasts or macrophages in various inflammatory processes. While epithelial cell-based ICAM-1 interacts with neutrophils and alveolar macrophages, the role of soluble or shed ICAM-1 is less clear. ICAM-1 is shed from the cell surface as a soluble molecule. As previously shown, its concentration in bronchoalveolar lavage increases upon lung injury 27. It is believed that shed ICAM-1 binds to alveolar macrophages, inducing an activation of these effector cells. Schmal et al. 28 have investigated the production of tumour necrosis factor-α and macrophage inflammatory protein-2 in alveolar macrophages upon exposure to soluble ICAM-1. Both mediators were upregulated in a nuclear factor-κB-dependent manner. In experiments carried out by the current authors, a sevoflurane-induced decrease in soluble ICAM-1 would therefore be associated with an attenuation of inflammatory responses regarding the proinflammatory function of alveolar macrophages. Increased adhesiveness between pneumocytes and neutrophils in the setting of an inflammatory response, probably induced by enhanced expression of cell-based ICAM-1, would be expected to lead to increased injury of the alveolar cell-lining barrier 7. Molecules such as vascular cell adhesion molecule-1 and endothelial-leukocyte adhesion molecule-1 could not be detected on these cells. With sevoflurane, adhesion of neutrophils to AEC was shown to be decreased, which consequently also reduced epithelial cell killing. Furthermore, attenuation of this biological function would also imply a diminished degree of injury. The rather small sevoflurane-induced decrease of cell surface ICAM-1 expression with a large biological effect on the attenuation of neutrophil adherence might be due to the fact that detection of cell-based ICAM-1 is not optimal. This problem was also observed in previous studies from the current authors’ group, in which an LPS-induced increase of cell-based ICAM-1 by 35% with a 300% upregulation of neutrophil adherence was found 15.
iNOS has been shown to play a crucial role in regulating expression of inflammatory mediators in acute lung injury, although results were contradictory. Shanley et al. 29 have demonstrated a significant decrease in the inflammatory response in iNOS-depleted mice in the IgG immune complex-mediated lung injury: expression of inflammatory mediators and neutrophil accumulation in the lung were diminished in iNOS-/- mice. In the LPS-induced lung injury, however, enhanced production of MCP-1 was observed in parallel with increased accumulation of neutrophils in iNOS-/- animals, assuming a protective effect of NO in this injury model 30. As NO has been demonstrated to be involved in postconditioning of ischaemia/reperfusion, this was considered as a possible pathway in the present model. Although in the current authors’ experiments iNOS production was increased in the LPS+sevoflurane groups compared with the LPS+air group, no biological consequence was observed when iNOS was blocked. Therefore, the hypothesis regarding the involvement of NO in the regulatory mechanism of sevoflurane-mediated cell protection was rejected. However, HSP-32 might be involved in the anti-inflammatory and antinecrotic effect of sevoflurane. This is not surprising, as volatile anaesthetics have been shown to upregulate HSP-70 and HSP-32 in the liver 31. HSPs are well-known protectants against injury, acting as cellular chaperones. A recent publication revealed evidence for HSP-70 in sevoflurane-induced protection against renal injury 32. Exploration of detailed cellular mechanisms in the endotoxin model of injury is under evaluation. A minor limitation of the present study is the fact that the LPS product used for these experiments is not ultra pure. Therefore, a contamination with lipoproteins cannot be excluded, which, upon stimulation with this relatively high dose of LPS, would activate the cells through a toll-like receptor 2 pathway. However, conclusions about the attenuating effect of sevoflurane upon injury of AEC with a bacterial product remain unchanged. Applying the present model to a clinical scenario would probably imply a mechanical ventilation of the patient with mechanical stress to AEC. This is a factor that was not considered in the experiments. However, it would certainly be of interest to evaluate the impact of sevoflurane under such conditions. In summary, the current authors’ findings of sevoflurane-induced attenuation of endotoxin-induced alveolar epithelial cell injury suggest that the application of sevoflurane has potential to attenuate the degree of injury in acute lung injury/acute respiratory distress syndome. Well-designed in vivo studies, followed by clinical studies are needed to transfer these results of basic research into clinical practice. The authors thank I. Odermatt (University of Zurich, Zurich, Switzerland) for development of illustrations and M. Agner (Berlin) for reviewing the manuscript. Pugin J, Verghese G, Widmer MC, Matthay MA. The alveolar space is the site of intense inflammatory and profibrotic reactions in the early phase of acute respiratory distress syndrome. Crit Care Med 1999;27:304–312. Round table conference. Acute lung injury. Am J Respir Crit Care Med 1998;158:675–679. Beck-Schimmer B, Schimmer RC, Warner RL, et al. Expression of lung vascular and airway ICAM-1 after exposure to bacterial lipopolysaccharide. Am J Respir Cell Mol Biol 1997;17:344–352. Yamasawa H, Ishii Y, Kitamura S. Cytokine-induced neutrophil chemoattractant in a rat model of lipopolysaccharide-induced acute lung injury. Inflammation 1999;23:263–274. Lundien MC, Mohammed KA, Nasreen N, et al. Induction of MCP-1 expression in airway epithelial cells: role of CCR2 receptor in airway epithelial injury. J Clin Immunol 2002;22:144–152. Beck-Schimmer B, Schwendener R, Pasch T, Reyes L, Booy C, Schimmer RC. Alveolar macrophages regulate neutrophil recruitment in endotoxin-induced lung injury. Respir Res 2005;6:61–66. Beck-Schimmer B, Madjdpour C, Kneller S, et al. Role of alveolar epithelial ICAM-1 in lipopolysachharide-induced lung inflammation. Eur Respir J 2002;19:1142–1150. Sheridan BC, McIntyre RC Jr, Meldrum DR, Fullerton DA. l-Arginine prevents lung neutrophil accumulation and preserves pulmonary endothelial function after endotoxin. Am J Physiol 1998;274:L337–L342. Mulligan MS, Hevel JM, Marletta MA, Ward PA. Tissue injury caused by deposition of immune complexes is l-arginine dependent. Proc Nat Acad Sci USA 1991;88:6338–6342. Suter D, Spahn DR, Blumenthal S, et al. 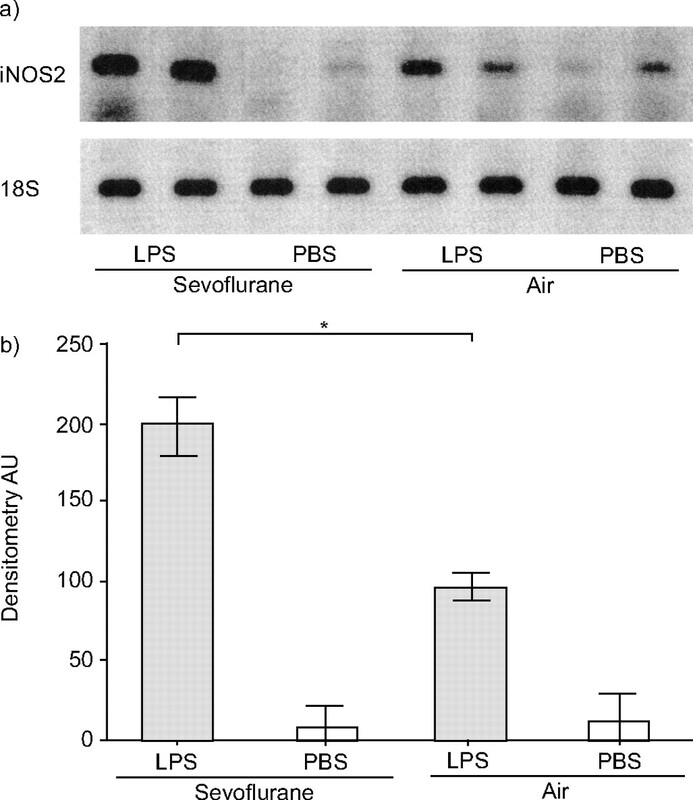 The immunomodulatory effect of sevoflurane in endotoxin-injured alveolar epithelial cells. Anesth Analg 2007;104:638–645. Murry CE, Jennings RB, Reimer KA. Preconditioning with ischemia: a delay of lethal cell injury in ischemic myocardium. Circulation 1986;74:1124–1136. Yellon DM, Opie LH. Postconditioning for protection of the infarcting heart. Lancet 2006;367:456–458. Douglas WH, Kaighn ME. Clonal isolation of differentiated rat lung cells. In vitro 1974;10:230–237. Obal D, Preckel B, Scharbatke H, et al. One MAC of sevoflurane provides protection against reperfusion injury in the rat heart in vivo. Br J Anaesth 2001;87:905–911. Madjdpour C, Oertli B, Ziegler U, Bonvini JM, Pasch T, Beck-Schimmer B. Lipopolysaccharide induces functional ICAM-1 expression in rat alveolar epithelial cells in vitro. Am J Physiol Lung Cell Mol Physiol 2000;278:L572–L579. Simon RH, DeHart PD. Todd RF 3rd. Neutrophil-induced injury of rat pulmonary alveolar epithelial cells. J Clin Invest 1986;78:1375–1386. Blumenthal S, Borgeat A, Pasch T, et al. Ropivacaine decreases inflammation in experimental endotoxin-induced lung injury. Anesthesiology 2006;104:961–969. Raeburn CD, Cleveland JC Jr, Zimmerman MA, Harken AH. Organ preconditioning. Arch Surg 2001;136:1263–1266. Mullenheim J, Ebel D, Bauer M, et al. Sevoflurane confers additional cardioprotection after ischemic late preconditioning in rabbits. Anesthesiology 2003;99:624–631. Hawaleshka A, Jacobsohn E. Ischaemic preconditioning: mechanisms and potential clinical applications. Can J Anaesth 1998;45:670–682. Tanaka K, Ludwig LM, Kersten JR, Pagel PS, Warltier DC. Mechanisms of cardioprotection by volatile anesthetics. Anesthesiology 2004;100:707–721. Zhao ZQ, Corvera JS, Halkos ME, et al. Inhibition of myocardial injury by ischemic postconditioning during reperfusion: comparison with ischemic preconditioning. Am J Physiol Heart Circ Physiol 2003;285:H579–H588. Crisostomo PR, Wairiuko GM, Wang M, Tsai BM, Morrell ED, Meldrum DR. Preconditioning versus postconditioning: mechanisms and therapeutic potentials. J Am Coll Surg 2006;202:797–812. Giraud O, Molliex S, Rolland C, et al. Halogenated anesthetics reduce interleukin-1β-induced cytokine secretion by rat alveolar type II cells in primary culture. Anesthesiology 2003;98:74–81. Paugam-Burtz C, Molliex S, Lardeux B, et al. Differential effects of halothane and thiopental on surfactant protein C messenger RNA in vivo and in vitro in rats. Anesthesiology 2000;93:805–810. Reutershan J, Chang D, Hayes JK, Ley K. Protective effects of isoflurane pretreatment in endotoxin-induced lung injury. Anesthesiology 2006;104:511–517. Mendez MP, Morris SB, Wilcoxen S, Greeson E, Moore B. Paine R 3rd. Shedding of soluble ICAM-1 into the alveolar space in murine models of acute lung injury. Am J Physiol Lung Cell Mol Physiol 2006;290:L962–L970. Schmal H, Czermak BJ, Lentsch AB, et al. Soluble ICAM-1 activates lung macrophages and enhances lung injury. J Immunol 1998;161:3685–3693. Shanley TP, Zhao B, Macariola DR, Denenberg A, Salzman AL, Ward PA. Role of nitric oxide in acute lung inflammation: lessons learned from the inducible nitric oxide synthase knockout mouse. Crit Care Med 2002;30:1960–1968. Speyer CL, Neff TA, Warner RL, et al. Regulatory effects of iNOS on acute lung inflammatory responses in mice. Am J Pathol 2003;163:2319–2328. Hoetzel A, Geiger S, Loop T, et al. Differential effects of volatile anesthetics on hepatic heme oxygenase-1 expression in the rat. Anesthesiology 2002;97:1318–1321. Lee HT, Ota-Setlik A, Fu Y, Nasr SH, Emala CW. Differential protective effects of volatile anesthetics against renal ischemia-reperfusion injury in vivo. Anesthesiology 2004;101:1313–1324.